Most people living in Western Society have probably seen a lot of articles and videos about clutter, minimizing, organization, and, well, stuff. A great deal of the marketing of professional organizers reminds me of marketing for the weight loss industry, it assumes there is a problem, that the problem is everyone has too much (weight, clutter, or whatever…) and needs to have less of it. Many of these sources have a lot of great advice, but much of that advice works better in theory than in practice. Most people know that in practice, weight is just one aspect of health, and being unhealthy and thin is not better than being healthy with some extra pounds. Likewise, having minimal possessions is not the key to happiness., having clean closets and shelves in the basement doesn’t help when the parts of a home that are actually used are messy, owning few possessions that are scattered impractically is not necessarily less cluttered than many that are well organized. I am the son of recreational shoppers, and I am also an artist who often works with collage and found objects. So, not only was I habitually going out to search for stuff, there was always the possibility of using old, weird, broken, and discarded items. But the more “potential” art projects I had, the less actual art I was doing. While the following may not specifically help everyone, here are some questions I learned to ask myself about my possessions. A simple switch changes the context of making the default focus on the short term effort of removing an item to the long term effort of keeping, storing, possibly displaying, and hopefully caring for an item. If you think about it, the latter can be a great deal of work. There’s little motivation to purge a useful item. However, just because something can be used doesn’t mean it will be used. Once I started asking myself this, a lot of my items started finding new homes with friends or being donated to good causes. A few situations involved conditions, like giving away an item to a friend with the agreement that I can use it if needed…and never actually needing it. Asking yourself who else could put an item to use makes the question not about the item, but how to actually make it useful. Likewise, if an item can be put directly to use, that’s literally more use-full than storing it for its potential. A side benefit to this sort of thing is improved social and community connections. Many of us have certain items that we’re more likely to collect. I often find old paintings at thrift shops or thrown away that I paint over. I also collect a lot of items that I “could” use as sculptures. After a while, I noticed that I actually painted over and re-used the canvasses but the sculpture items sat in a growing pile. Not only did this question help me get rid of stuff I wasn’t using, it motivated me to get to the paintings quicker! * Organizing, instead of just Purging. * “How easily can I get rid of this if I needed to? Again, it’s not the item, it’s the relationship with it. I like to dress up silly, and have accumulated a number of silly items, ranging from novelty hats to Halloween costume items. Most I have gotten at yard sales or thrift stores, so very little money was spent, and they fit nicely in bins in my ample closet space, so they aren’t really clutter. I use them enough that they aren’t neglected. But they aren’t important to me on a grand scale. I know this, and store them as such. Meanwhile, the more dignified shirts and suits I own are rarely used, but well worth keeping, so they are neatly stored as such. If I have a sudden need to move, I know which bins I can easily purge and which stuff I need to grab in an emergency. If you often need, say, pens or scissors, it’s important to have at least a couple pens or a pair of scissors handy. But that doesn’t mean you need to have a whole box of pens on your desk. One pen on the desk, a box in a drawer perhaps. In a painter’s case, one tube of each color on a workbench, the rest in a box underneath, etc. I found my relationship to my kitchen and meal prep changed drastically when I stopped storing all my pots and pans together, but have the ones used daily set aside. While I have a full and diverse pantry, the items I use on a daily basis are on a shelf I can easily grab from while cooking. While the organizing trend is often to purge anything nonessential that you’re not truly in love with, I have a lot of stuff that I just like, and I’m fine with that. I find myself using cardboard boxes enough that I have a large pile of them on a back shelf in my basement. Out of the way, but there if I need them, but also easy to get rid of if needed. My partner and I have a few collections of knick-knacks on shelves used to otherwise store things we don’t access much. 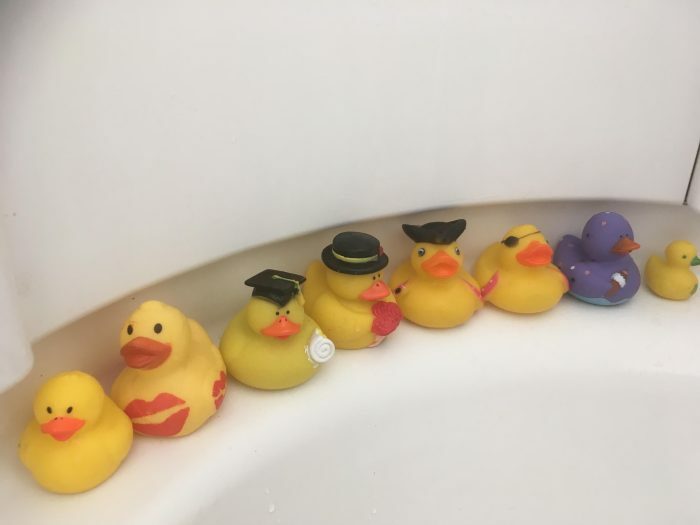 My bathtub has a strange inset ridge around it which is perfect for our growing rubber duck collection, a collection we wouldn’t have if the ducks got in the way of where we keep our soap and shampoo. Do we capital-L “love” the ducks? No. But we’re amused by them, and there’s nothing wrong with that. Rich “Koken” Mackin has lived in Boston, Portland (Oregon), and two small cities in Connecticut. 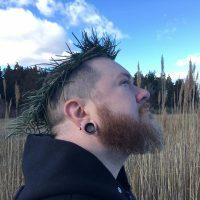 During that time, and in no specific order, he has sung in punk bands, created a zine empire, written two books and hundreds of silly letters to Corporate America, performed spoken word all over the country, was dubbed “Portland’s Best Superhero 2010”, graduated art school, saved Christmas, and lived in a Buddhist Temple for four years. He is currently attending a Graduate Studies Program at Wesleyan University.